1. 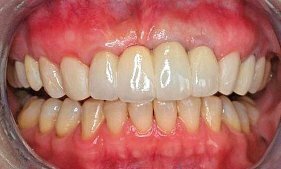 Treatment for Receding Gingival Tissue; 2. Veneers and Crowns; 3. Fixed Bridge; 4. 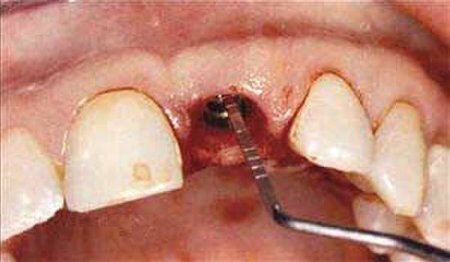 Dental Implant; 5. 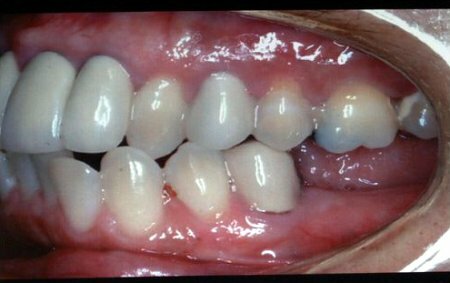 White Filling/Bonding; 6. 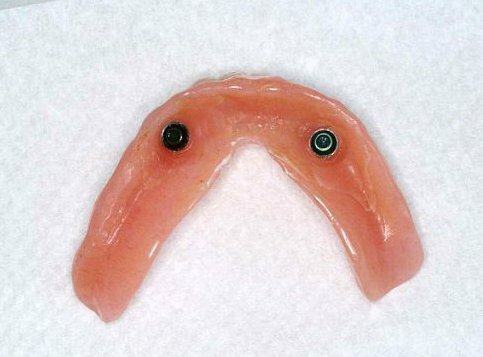 Partial Dentures/Dentures. please scoll down to see photos of actual cases of different procedures. 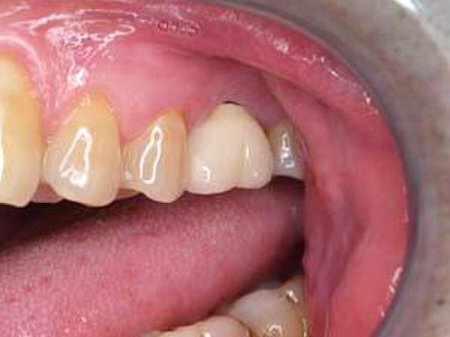 This patient had gingival tissue receding on multiple teeth, which caused cosmetic concern and strong sensitivity. 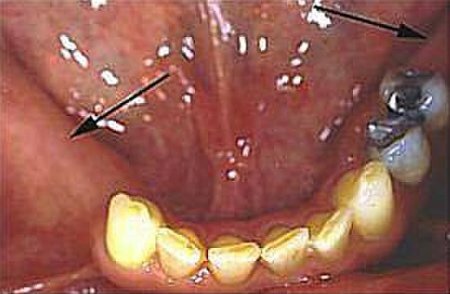 Connective tissue graft was performed on the teeth with receding gingival tissue. Note the grafted tissue covers the receding area. 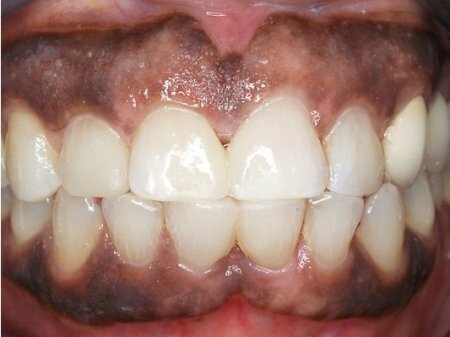 Patient's cold/hot sensitvity and the chance of root caries were greatly reduced, and better esthetics. 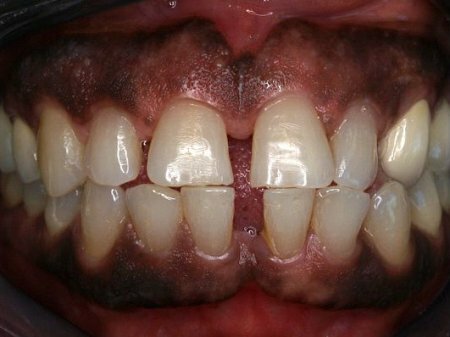 This patient had receding gingival tissue on the upper right canine, which caused strong cold and hot sensitivity. Connective tissue graft performed, photo taken only 1 month later. Cold and hot sensitivity was greatly decreased after procedure. The grafted tissue continues to blend with the surrounding tissue. 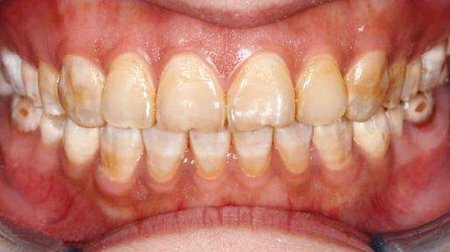 The Patient complained about the unesthetic appearance on the bridge on the upper left area. 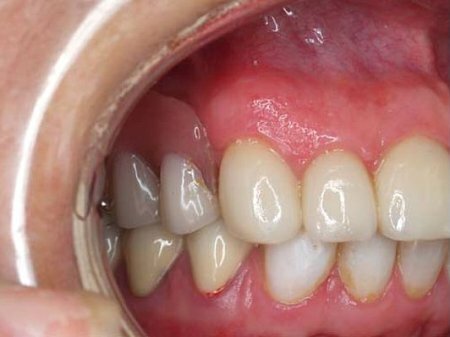 (There is a black margin on the anchor tooth and gingival receding on the same tooth.) 1. 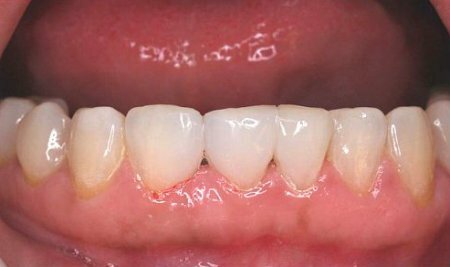 Gingival tissue graft was used to correct the receding problem on the anchor tooth . 2. A new bridge was fabricated to replace the old bridge. 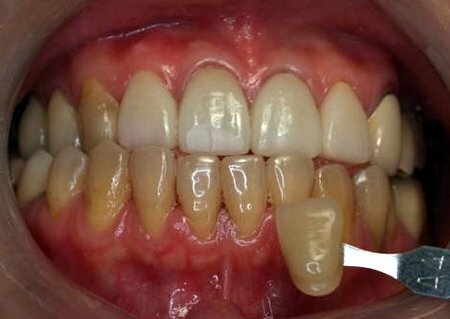 A young girl had a severe receding gingival tissue, which caused strong sensitivity and esthetic concern. 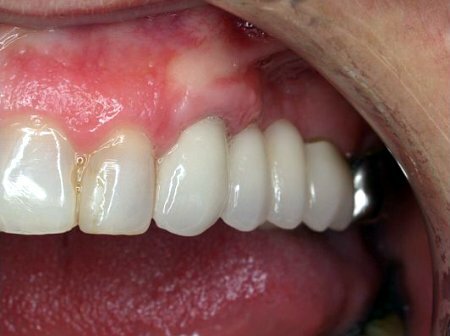 Connective tissue graft performed to correct the gingival receding. We expect the tissue level to remain at this position for a very, very long time. 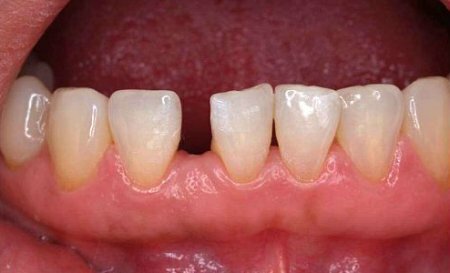 Porcelain veneers were placed on upper and lower anterior teeth. close-up picture. close-up upper teeth. Very unapealling anterior teeth. 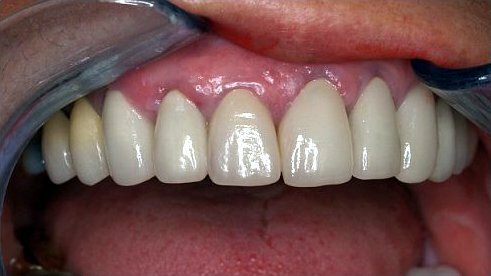 Porcelain veneers were placed on upper arch. The patient may have his lower teeth done in the future. 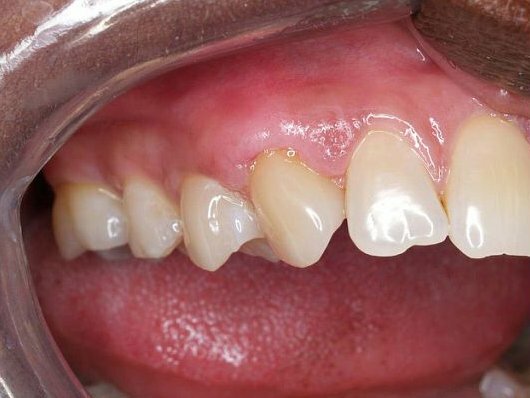 Black tooth on the upper anterior area. Severe decay. 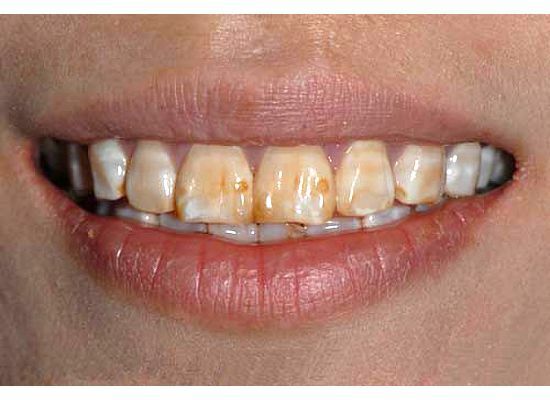 Bleaching procedure was completed before the crown procedure. 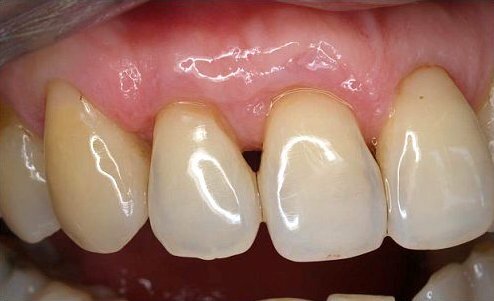 Full porcelain crown was used to restore the tooth. Front teeth fractured due to an accident. 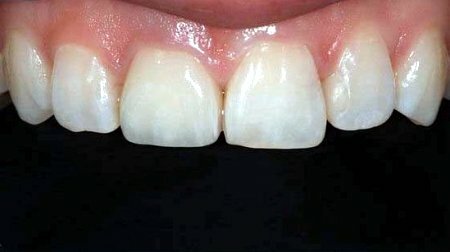 Crown and bonding technique was used to restore the fractured teeth. 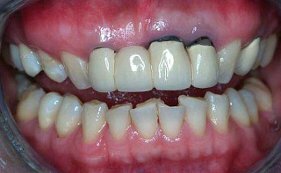 This patient did not like the black margins on her 4 crowns of the anterior teeth. 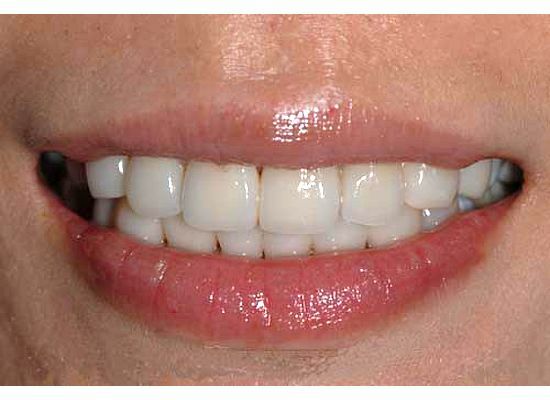 We used 4 full porcelain/ceramic crowns to replace the 4 previous porcelain-fused- to-metal crowns. Notice the black margins are gone, and the crowns look much more life like. (This is because it is more transparent). This patient was very unhappy about the appearance of her crowns. 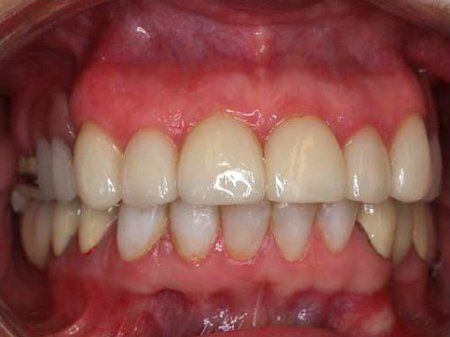 Periodontal procedure was used to correct the inflamed and reddish gingival tissue. 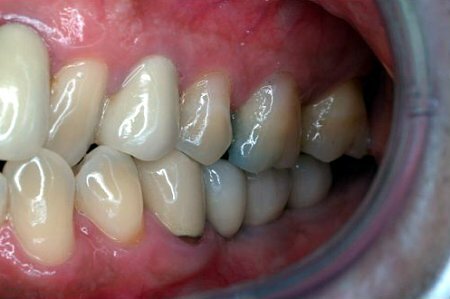 Afterwards, full porcelain/ceramic crowns were used to replace all the crowns with black margins. Hopefully the patient will do something to her lower teeth in the future. 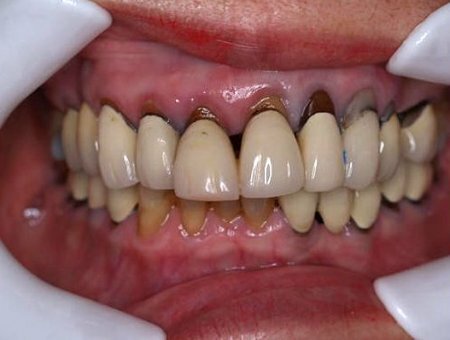 The patient wanted to improve her smile. 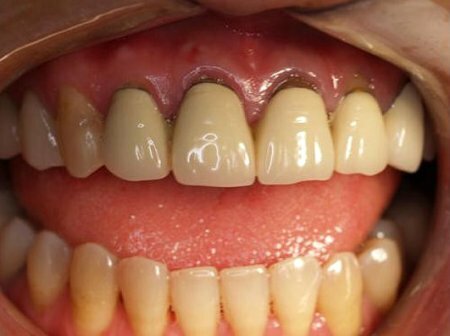 This patient wanted to redo her crowns on her anterior teeth. 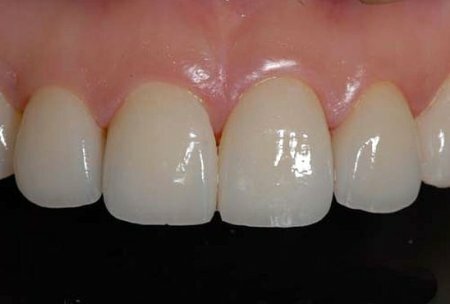 The anterior crowns were redone by using full porcelain crown. 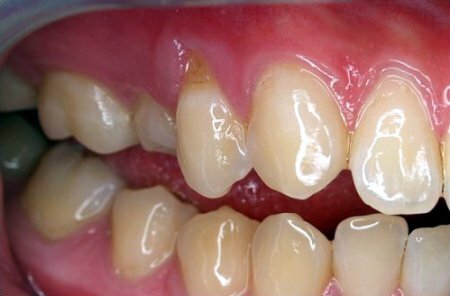 Notice the improvement of the translucency and blackness of gum tissue and crowns disappear. Notice her new improved smile. 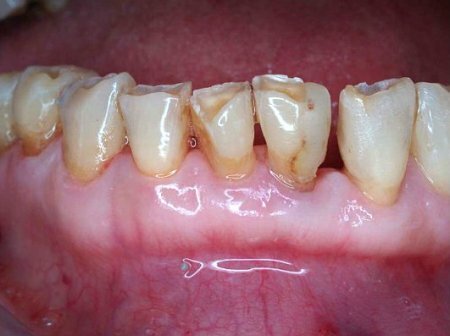 The Patient complained about the unesthetic appearance on the bridge on the upper left area. 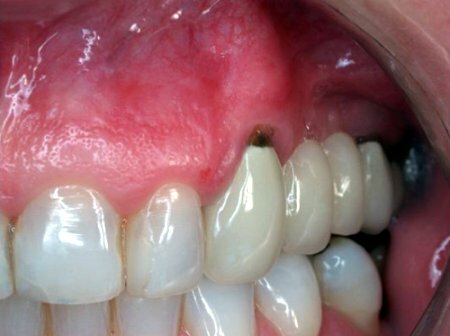 (There is a black margin on the anchor tooth and gingival receding on the same tooth.) 1. 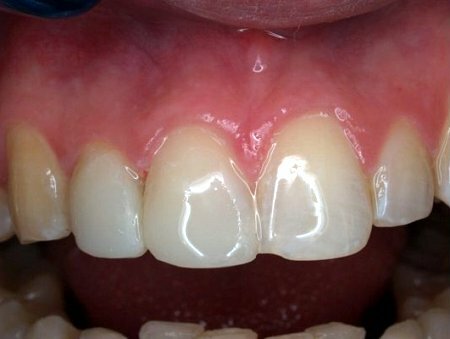 Gingival tissue graft was used to correct the receding problem on the anchor tooth. 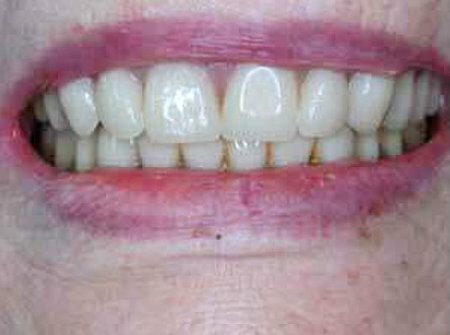 This patient missing all her posterior teeth on the lower left area. 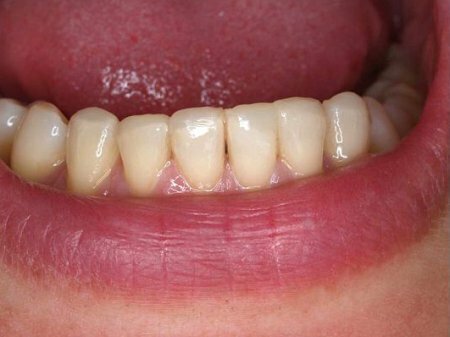 Dental implants were used to replace the missing posterior teeth on the lower left area. At this time, we used two dental implants as anchors, and a fixed bridge was supported by these two implants. 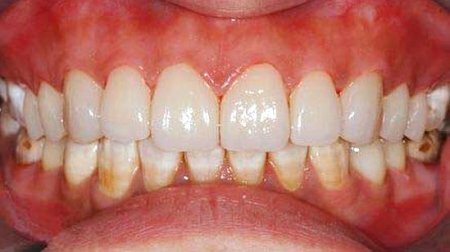 This patient lost a molar tooth on the upper left area. 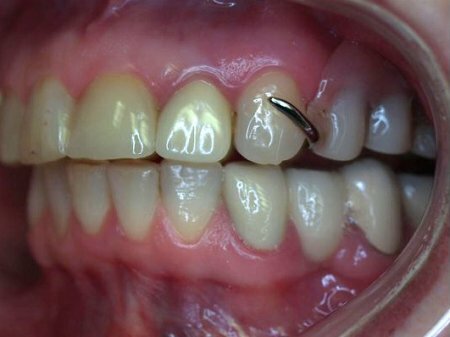 A dental implant was placed in the missing tooth area. 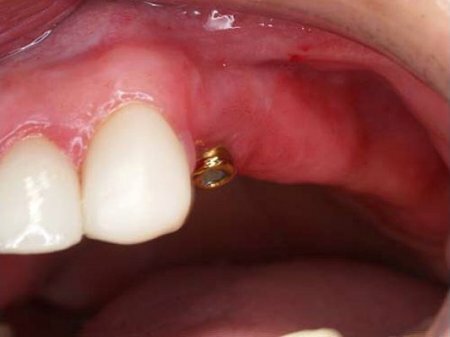 The metal on the picture is a post connected to the dental implant placed under the bone. 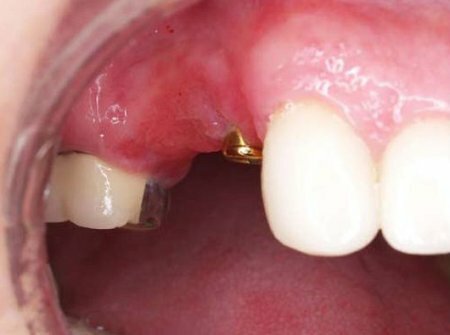 A porcelain fused to metal crown was placed on top of the dental implant to restore the single missing tooth. 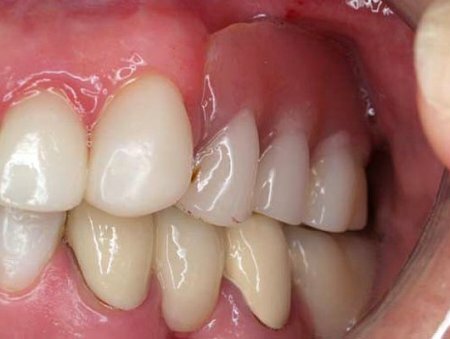 This patient had a failed root canal treated tooth on the upper left central incisor, which could not be saved. The failed tooth was extracted. 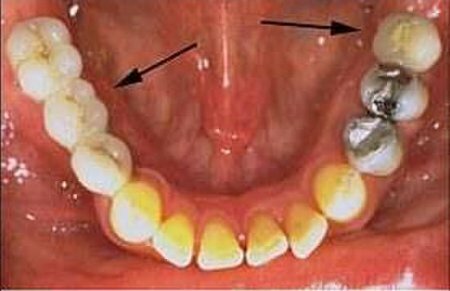 At the same time, a dental implant was placed into the socket. 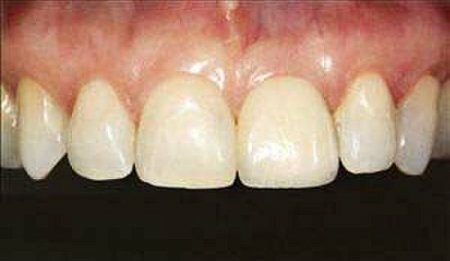 After a four month healing period, a porcelain crown was placed on top of the dental implant to replace the extracted tooth. Another close-up photo of this case. The failed tooth was extracted. 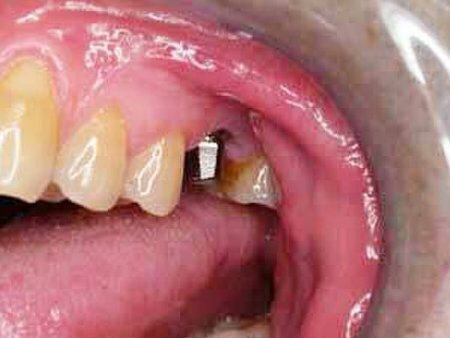 At the same time, a dental implant was placed into the socket. 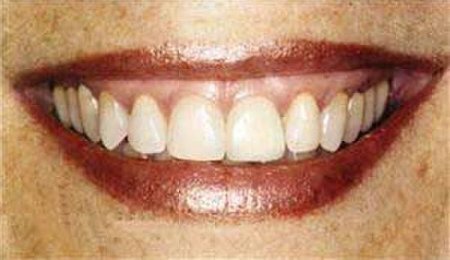 Dental implants were used to restore the missing teeth. The failed tooth was extracted. 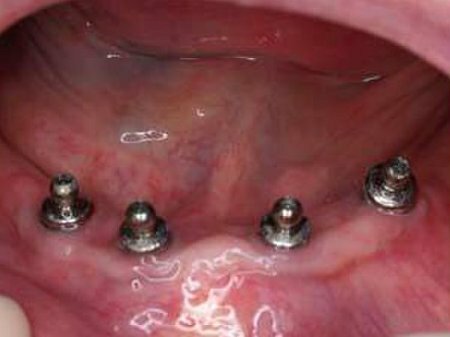 At the same time, a dental implant was placed into the socket. 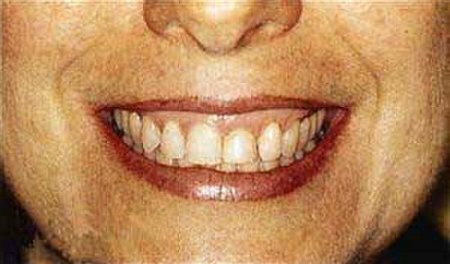 This patient had upper and lower full dentures. 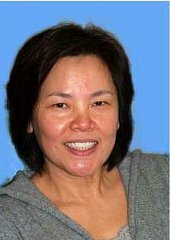 The lower denture was very loose, so we placed two implants on the lower arch. We also connected two fixtures (or locators) to the dental implants. 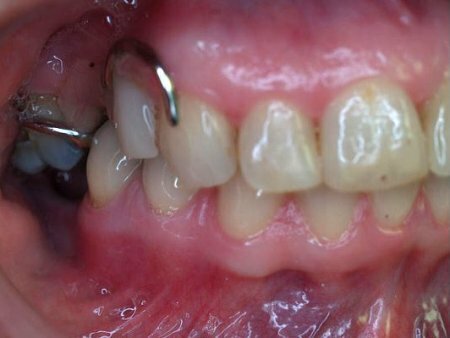 This patient had a fractured root of an anchored tooth from a previous bridge. 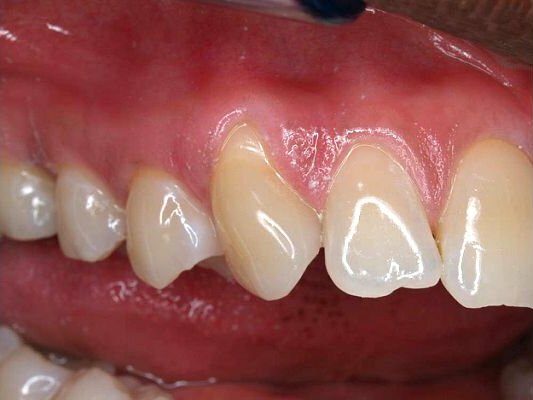 The bridge was removed, both teeth were extracted, and bone graft material was used to preserve the bone thickness. 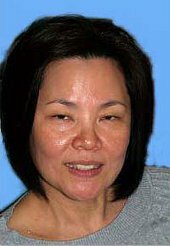 Three implants were used to replace the missing teeth. figure 1: fractured root under a bridge. figure 2: implant placement. figure 3: crowns placed on top of the implants. Case finished. Case #21 after, front view Case 21 after, right side view. 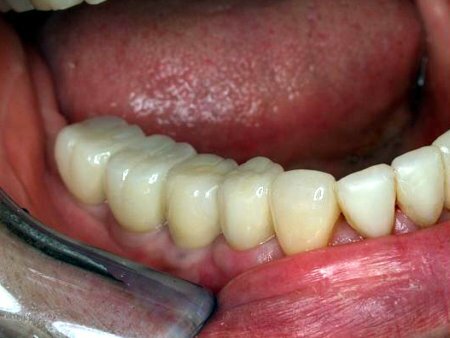 Two implants were placed behind the canines, so that the partial denture is supported by the two implants. The two metal clasps were eliminated, the upper partial was better retained. The patient has better esthetics and funtion. 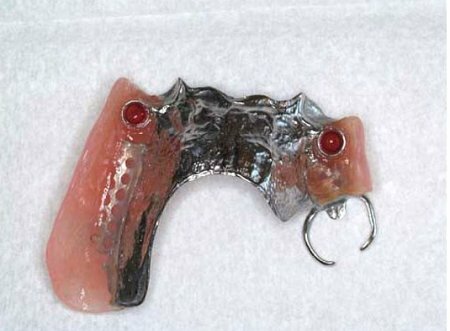 Two implants were placed behind the canines, so that the partial denture is supported by the two implants. The two metal clasps were eliminated, the upper partial was better retained. The patient has better esthetics and funtion. 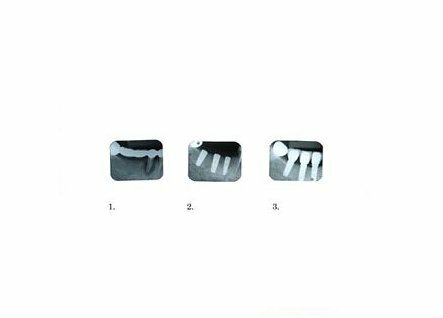 Two implants were placed behind the canines, so that the partial denture is supported by the two implants. The two metal clasps were eliminated, the upper partial was better retained. The patient has better esthetics and funtion. Note there are two plastic housings built on the upper partial in order to connect to the implants. There are two tiny metal connectors (locators) connected to the implant. The connectors are able to click to the plastic housings (last photo). The patient is still able to take off the partial to clean. This is the right side. There are two tiny metal connectors (locators) connected to the implant. The connectors are able to click to the plasti c housings (last photo). The patient is still able to take off the partial to clean. This is the left side. 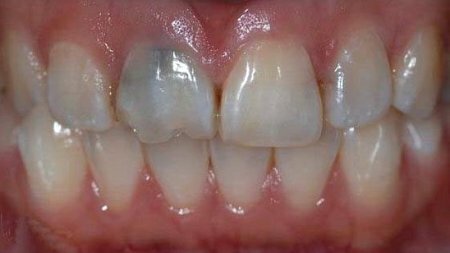 Patient complained of the gap on the lower anterior teeth, and she did not want braces and porcelain veneers due to financial reasons. 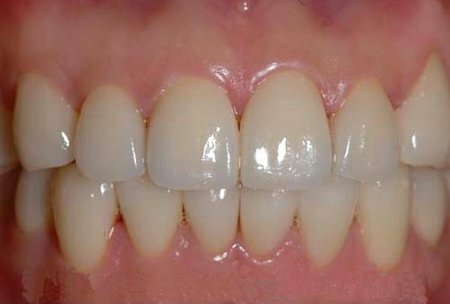 Composite bondings were placed on the teeth with the gap; it was a very simple, economic, and conservative way to greatly improve the patient's smile. 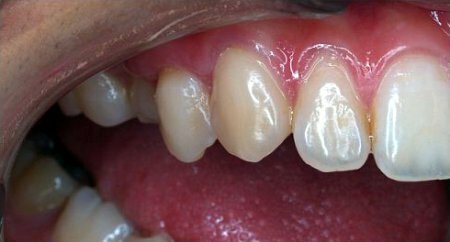 Patient had many worn, chipped teeth on the lower arch. This is another example of composite bonding. 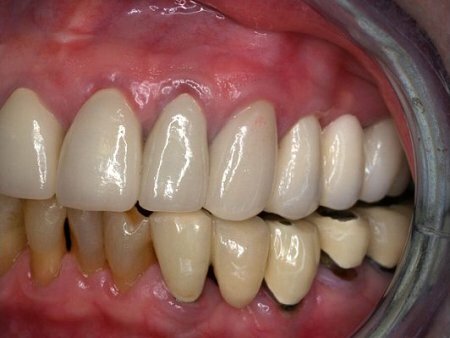 Composite bonding/filling is a very simple, economic, and conservative way to restore lost tooth structure and function, and improve esthetics. 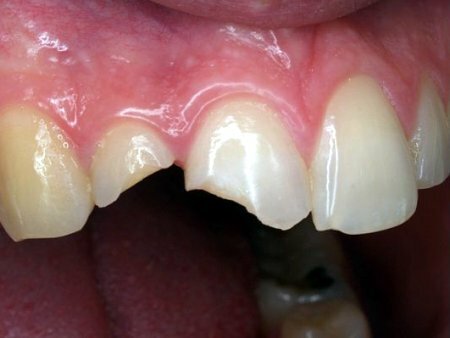 The patient wanted to close the gaps between her front teeth. Orthodontic treatment option was presented but declined. Bonding technique was used. 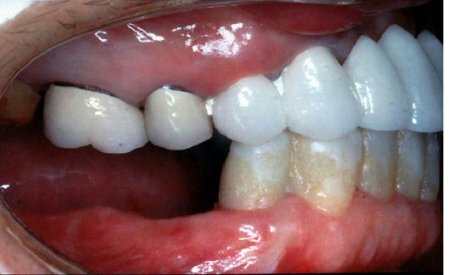 The treatment approach for this case was very effective and conservative. No dental structure was removed. The treatment was completed in one appointment only. There are two tiny metal connectors (locators) connected to the implant. The connectors are able to click to the plastic housings (last photo). The patient is still able to take off the partial to clean. This is the right side. There are two tiny metal connectors (locators) connected to the implant. The connectors are able to click to the plastic housings (last photo). The patient is still able to take off the partial to clean. This is the left side.